Are you thinking about taking a spa vacation? Before you start planning your trip, you'll need to decide exactly what type of spa escape best meets your needs. With so many choices available, defining your need before you start doing your research is the key to making your search manageable. If you're looking for some 'me' time where you can relax and enjoy some pampering, you'll want to look for a spa that specializes in helping guests relax in a luxurious setting. If your idea of the perfect vacation is to stay in a beautiful resort in a lovely location where you can enjoy on-site pampering services, a resort/hotel spa is a great option for you. Some of these spa destinations are in tranquil, off-the-beaten-path settings, while others are in well-known resort areas. Whatever setting you choose, you can expect to have a chance to relax, unwind and focus on you - with access to an extensive variety of spa services. 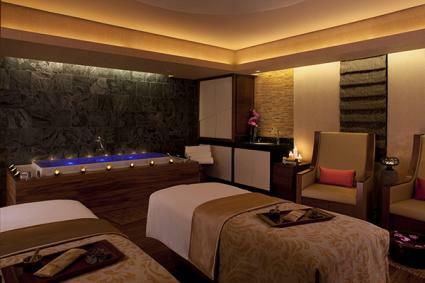 Omni Hotels & Resorts has a number of spa-focused luxurious resorts in popular tourist destinations throughout the U.S. such as Orlando, Florida and Scottsdale, Arizona, as well as in Cancun, Mexico. Omni spa resorts offer "premium spa services" in "an exceptional environment to stimulate the senses, so you can unwind and relax within minutes." If you prefer a tranquil destination that is in a more remote area, yet still want to enjoy outstanding spa services in a luxurious setting, r&r resorts may be a better option for you. This company has spa resort facilities in Dahlonega, Georgia, which is a very small town in the foothills of the Appalachian Mountains, as well as Puravida in Costa Rica and Maya Tulum in Mexico. Not all hotels that include luxurious spa facilities are in tranquil settings or popular vacation destinations. Some are located in major cities, especially those that attract business travelers and convention delegates. This type of spa hotel is great if you want to relax before or after a big meeting or conference, or if you are accompanying a partner who has business in a particular location and want to enjoy pampering treatments while your travel companion is working. Peninsula hotels are luxurious boutique properties in major cities around the world that cater to guests who expect the ultimate in pampering experiences. The Peninsula New York, located in Manhattan, has extensive spa and wellness services, as do the company's properties in Chicago and Beverly Hills. A mineral springs spa is one that provides guests with an opportunity to soak in a mineral spring water. These spas are good vacation getaways, and are particularly beneficial for those who hope to enjoy the health and wellness benefits associated with soaking in mineral spring water. While there are no guaranteed medicinal benefits associated with mineral spring water, Spavelous magazine asserts that it can facilitate healing through killing germs, improving blood flow, removing toxins, boosting metabolism, relieving aches and pains and more. The Greenbrier in While Sulphur Springs, West Virginia is home to a natural white sulphur spring that people have sought out for health promotion and healing benefits since the 1700s. Modern day visitors can soak in the springs, as well as enjoy a full selection of spa services, meditation sessions, comfortable accommodations and more. Named as a top choice for mineral and thermal springs spas by readers of the SpaFinder.com blog, the Greenbrier is a popular spa getaway. 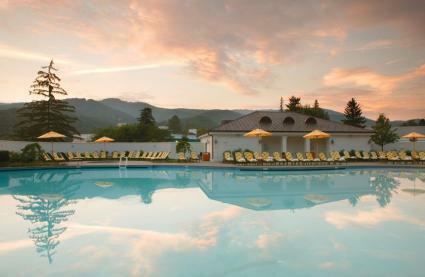 As a matter of fact, the New Orleans Saints have made the Greenbrier their home base for pre-season training. If your focus is on meeting a particular health need or you want to jump start your health promotion goals with a time-out at a spa, you'll want to look for a facility with a more medical focus. A weight loss spa is designed to meet the needs of guests who want to spend their vacation time focusing on their weight loss efforts. You might decide to plan a getaway to this type of spa if you want to kick-start your intention to lose weight, or during a weight loss journey that you have already started. According to an article on Oprah.com, these spas are not like the 'fat farms' of past decades, focusing instead on a holistic approach to "lifestyle changes that can be adhered to once back at home." The Canyon Ranch Weight Loss Program at the Life Enhancement Center in Tucson Arizona is an example of a weight loss spa, and it's one that CNN recommends on its list of nine deluxe weight loss vacations. The Canyon Ranch weight loss program is one of several tracks guests of Canyon Ranch can select. Nutritionists and other medical professionals work with guests to customize a weight loss lifestyle plan that meets their needs, with the goal being to help set them on a path wellness to accomplish weight loss goals and maintain them for the long term. A fitness spa is one where the focus is on physical fitness. While weight loss spas will typically include elements of physical fitness, not all fitness-oriented spas cater to those who want to boost their physical fitness. These spas often appeal to long-time fitness enthusiasts who want to escape from their day-to-day routines to focus on their overall health and wellness in a fitness-focused setting. Options are also available to those looking to begin the process of getting in shape. Traditional spa services are available, but guests can also engage in a variety of fitness-oriented endeavors. For example, in addition to having a luxurious spa facility, Hawaii's Travaasa Hana spa resort provides guests with access to both yoga and outdoor circuit training activities. These activities earned the destination resort a spot on the Fodor'sTravel 2014 list of the top fitness and wellness resorts in the U.S. When you visit this type of spa, you can expect to be able to enjoy the traditional pampering services available at any spa, along with additional medical services provided by licensed practitioners are also available. Licensing for medical spas varies by state, but these facilities are typically operated under the supervision of a licensed physician. If you are looking to deal with a skin condition or have cosmetic procedures performed in a spa setting, a medical spa might be right for you. According to AmSpa, examples of the types of services you can expect include "Botox, laser hair removal, and medical-grade skin therapies." Appalachian Regional Healthcare points out that "a medical spa can treat facial conditions like brown spots, redness, and broken capillaries that cannot be treated at all or as effectively by a traditional salon." Cure Spa Malibu Beach Inn in California is an example of a medical spa, offering guests a tranquil escape where they can enjoy pampering while also seeking treatment for a variety of skin conditions and cosmetic procedures. Now it's time to select a property that meets your specific needs and interests. If you don't already have a specific spa in mind, try using SpaFinder.com or SpaSeekers.com to locate places to consider.